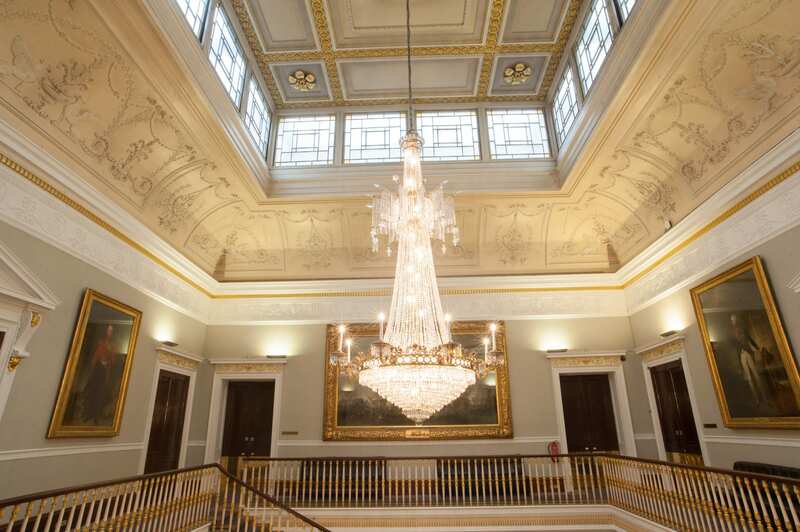 Over the past few months, 116 Pall Mall has been undergoing interior and exterior refurbishment to help improve the upkeep of the building and restore its stunning original features. The front of house reception area now boasts an elegant and accessible reception desk, beautiful period furnishings and the original mosaic floor has been renovated, in-keeping with the unique heritage of the building. Interior designers, Russell Sage Studios, have restored some original features and transformed the ground floor and grand staircase area to reflect the building’s Regency elegance and former glory. The Purbeck stone colour enhances the building’s beautiful features, taking you back in time as you walk through the front doors. The entire exterior of the building has been repainted and restored and stands out once again as one of the most iconic Pall Mall landmarks. To view the venue or book a site visit, call 020 7451 3107 or email functions@iod.com.